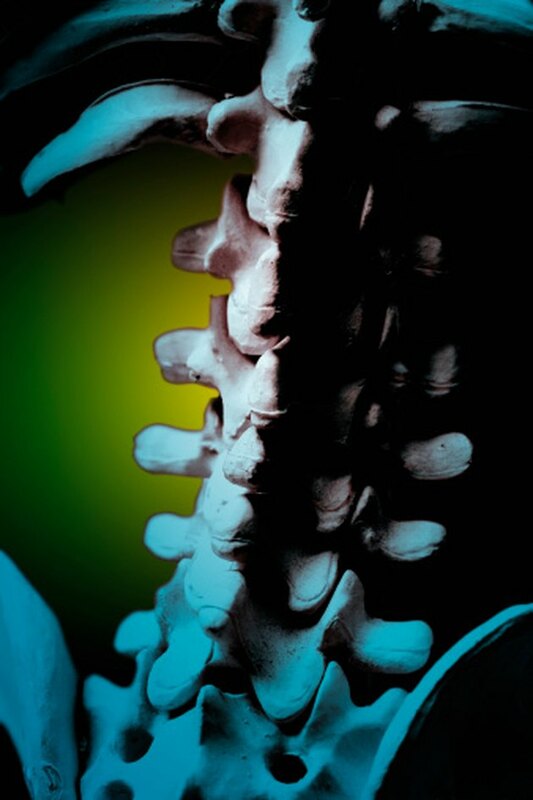 Compression fractures, also called "wedge fractures," of the spine occur when one or more vertebra collapse. This may be caused by extreme vertical trauma, osteogenesis imperfecta--brittle bone disease--or osteoporosis. Most compression fractures occur in the thoracic section of the spine. T12, or thoracic vertebra 12, is the last vertebra in the thoracic spine, right at the top of the lower back curve. Falls in which a person lands on the buttocks or feet can cause a compression fracture of the T12 vertebra. According to MD Guidelines, 75 to 90 percent of all thoraco-lumbar fractures occur without spinal cord injury. Full recovery from a T12 compression fracture requires physical therapy to regain and improve core strength and flexibility. Do this exercise on the floor or a sturdy table. Lie on your back with your knees bent. Keep your trunk straight. Your feet should be flat on the floor and your arms should be by your sides. Press your arms into the floor, engage your stomach muscles, then lift your buttocks up off the floor until your back is one straight line from your hips to your shoulders. Hold for three to five seconds, then slowly lower. Repeat three to five times. This exercise increases the mobility of the spinal column and improves back flexibility. Use a yoga mat or exercise mat to protect the knees from hard floor surfaces. Start on all fours with your hands under your shoulders and knees under your hips. Lift your head so your spine is in a straight line. Pull your navel into your spine, tilt your pelvis, and round your upper back as high as you can. Drop your head towards the floor. Hold for three to five seconds. Slowly release and bring your head up as you relax your back. Allow your lower back to arch slightly and squeeze your shoulder blades together. Return to the starting position with a flat back. Repeat two to three times. This core strengthening move allows you to increase abdominal strength without performing crunches. Lie on your back with your knees bent and your feet flat on the floor. Keep your back in a neutral position. Tighten your abs, then raise your right leg off the floor until your lower leg is parallel to the floor. Press your right hand against your raised knee while you try to pull your knee toward your hand. Use your abdominal muscles and keep your arm straight. Breathe during this exercise and press for a count of five. Return to the starting position and repeat on the left side. Do three to five repetitions on each side. Always consult your doctor and physical therapist before you begin any exercise program following a spinal injury. It is important that rehabilitation does not begin until the fracture is healed. Until then, the spine must be kept immobile to aid in healing. Because the injury may take up to several years to fully heal, patients should take care not to overload the site of fracture. Heavy lifting should be avoided, and proper lifting should be used at all times. Sci-Info-Pages; Spinal Cord Injury Levels &amp; Classification; Wise Young, Ph.D.